Author uses the three most involved individuals in the First and Second Great Awakening to serve as examples. Within the pages of Chima Umejiaku’s book, "Pursuit of Spiritual Renewal: A Call To Corporate and Individual Revival" ($17.99, paperback, 9781545608111; $8.99, e-book, 9781545608128), readers will find certain processes of achieving spiritual renewal, such as studying God’s Word, biblical meditation, prayer, discernment, fasting, and praise and worship. Umejiaku examines those involved in the First and Second Great Awakening in the United States and around the world, three notable individuals were George Whitefield, Jonathan Edwards, and Charles Finney, whose legacies still live on. Umejiaku believes spiritual renewal begins from the heart. Therefore, there must be spiritual heart transplant for a personal revival to occur, because a transformed heart is a renewed heart, and a renewed heart is a revived life. “We are all yearning for revival in our quest to maintain closeness to God,” said Umejiaku. Chima Umejiaku is a pastor of Christian Assembly in Lynn and Lowell, Massachusetts. He holds a doctoral degree in theology and two master's degrees: one in theology and another in special education, and also a first degree in special education. Xulon Press, a division of Salem Media Group, is the world’s largest Christian self-publisher, with more than 12,000 titles published to date. 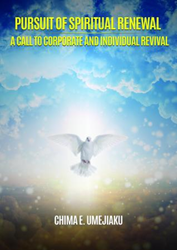 "Pursuit of Spiritual Renewal: A Call To Corporate and Individual Revival" is available online through xulonpress.com/bookstore, amazon.com, and barnesandnoble.com.